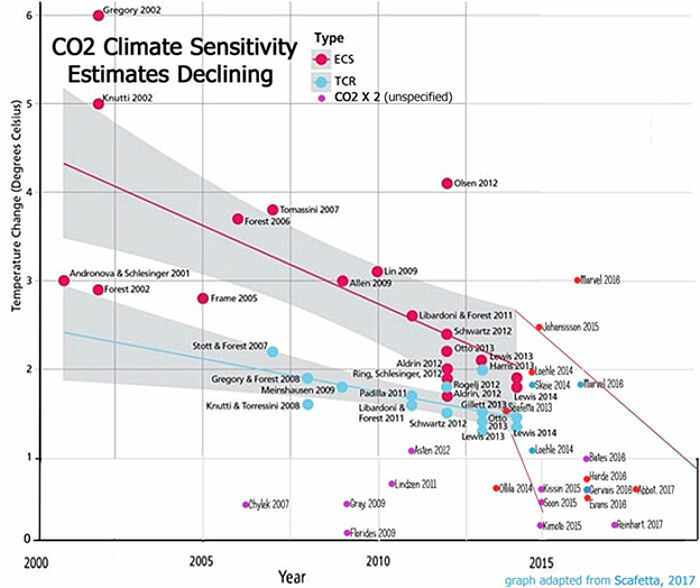 Recent research has provided greatly reduced estimates of climate sensitivity to increased atmospheric CO2 concentrations. This research suggests that a doubling of atmospheric CO2 concentrations, to 540 ppm, would result in an increase of ~1.7°C (~3°F) above pre-industrial global annual average near-surface temperatures. Approximately 1°C (~1.6°F) of this projected increase is reported to have already occurred. Based on recent analyses, that 3°F temperature increase would manifest as an increase of ~1°F in average annual maximum temperatures and an increase of ~2°F in average annual minimum temperatures in many of the most populous nations on the globe; and, as the average for the globe. These changes would be expected to occur over approximately the remainder of the century, assuming rates of global annual CO2 emissions remain relatively constant. 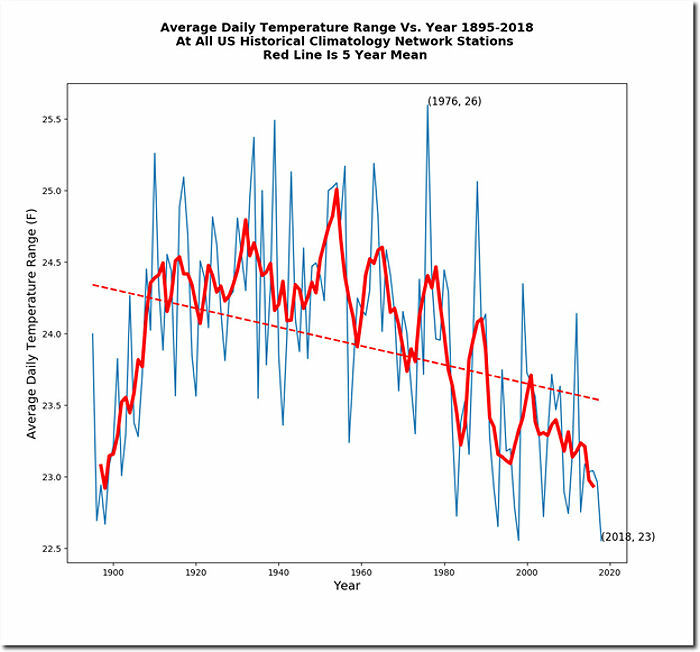 An increase of 1°F in annual maximum temperature would be of greatest concern if it manifested as an increase in the number of very hot days or an increase in the temperatures on the hottest days. However, this is not the case, at least in the US, where the annual number of days reaching or exceeding 95°F has been declining on average over the period from 1900 to 2018; and, declining precipitously since the peak in the 1930s.Rather, the increase has manifested as an increase in the average daily maximum temperature while not significantly affecting the frequency or magnitude of extreme temperatures. Similarly, the number of nights reaching temperatures at or below 0°F has decreased over the period 1900 to 2018, indicating that winter temperatures have become less extreme as well. An increase of 2°F in annual average minimum temperatures would be of greatest concern if the increase were associated primarily with the occurrence of extremely hot days. 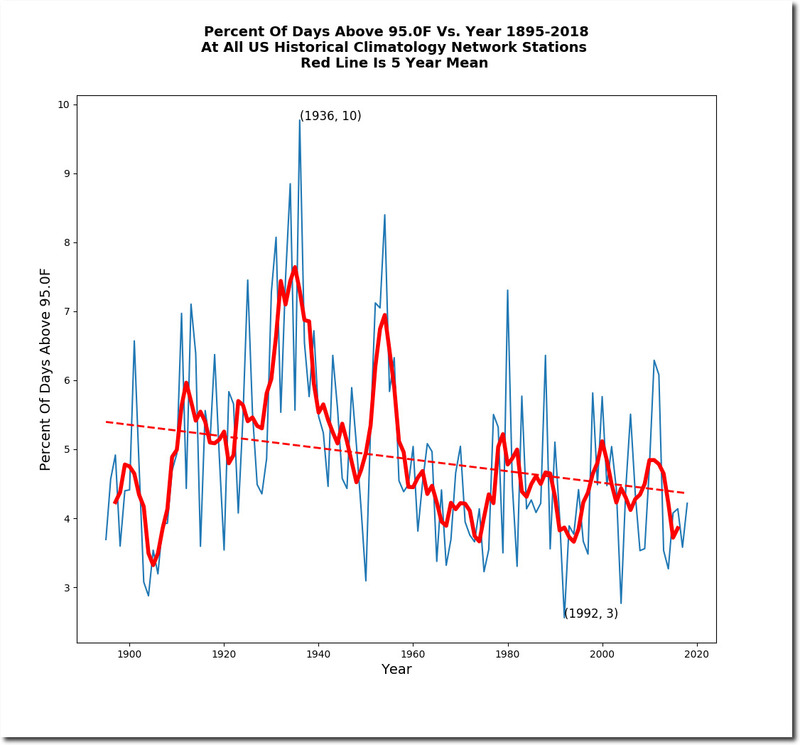 However, as noted above, the frequency of extremely hot days is decreasing, so it is likely that the increase in average minimum temperature during the summer months is more uniformly distributed. The combination of the more rapid rise of average annual minimum temperatures, relative to average annual maximum temperatures, and the decline in both hot and cold extreme temperatures has resulted in a decrease in the average daily temperature range of approximately 2°F ,or approximately 10%, in the US over the period from 1900 to 2018. However, this still means that daily average temperatures change by +/- 23°F roughly every 12 hours and +/- 40-50°F seasonally. Mexico is the only one of the most populace nations in which the annual average maximum temperature is increasing more rapidly than the annual average minimum temperature, though both are increasing more slowly than the global average temperature change. Russia and Nigeria are the only ones of the most populous nations in which the average annual maximum temperature is increasing more rapidly than the global average temperature change. China is the most anomalous of the most populous countries, in that the annual average maximum temperature is increasing at only ~7% of the rate of increase of the global annual average temperature; and, only ~3% of the rate of increase of the annual average minimum temperature. 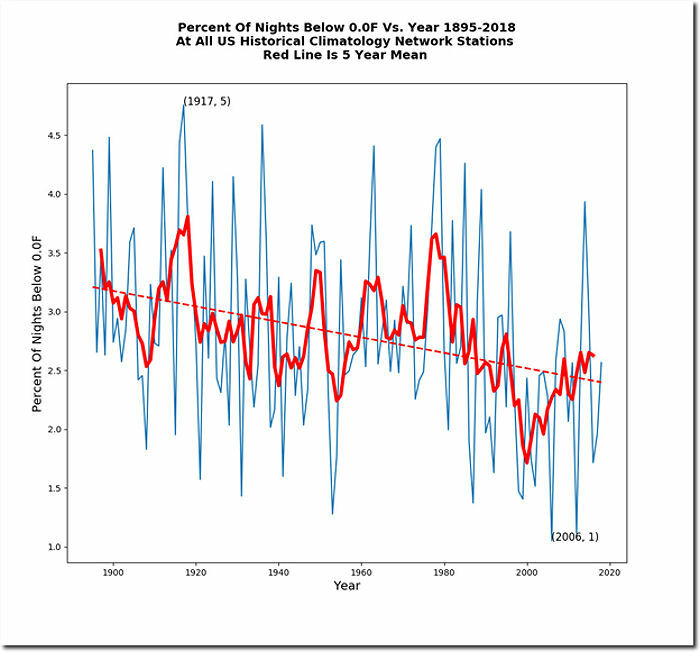 Thank you for visiting https://www.therightinsight.org:443/Warming-Significance! Be sure and revisit therightinsight.org frequently for content updates and more.